Tonight’s Book Show was recorded at Smock Alley Theatre in front of a live audience. 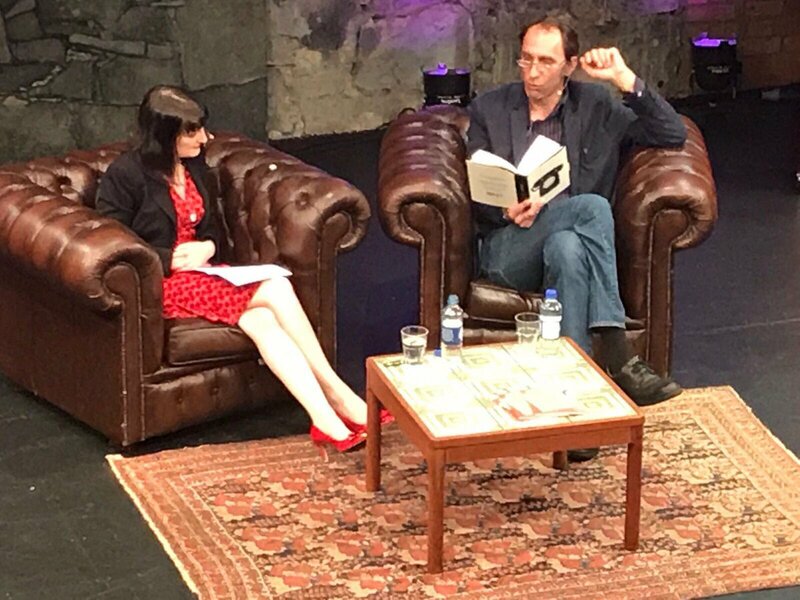 Sinéad Gleeson interviewed the British writer Will Self during this year’s International Festival of Literature Dublin. He was in town to discuss his latest novel Phone – the 3rd novel in a trilogy which also includes Umbrella and Shark. Phone opens with neurologist Dr.Zack Busner who is suffering the early onset of dementia. He’s wandering about a hotel in Manchester and he’s not wearing any clothes. His grandson has given him a mobile phone and is desperately trying to contact him. From here the novel widens to tackle some of the themes which Self has written about in his other work – themes of technology and the impact that changes in the way we receive information has had on our minds and on our society. We’re introduced to a character called The Butcher, a closeted gay man, who is a spy and who is having a secret affair with a soldier Gawain Thomas. These two characters are drawn into the dark heart of the novel and into what Self says is the dark heart of modern Britain – the 2003 war in Iraq. The abuse perpetrated by some British soldiers against Iraqi detainees finds its way into the novel and in his discussion with Sinéad, Self says that the recent Chilcot report investigating this dark episode didn’t do its job. He says that Britain’s sentimental relationship with its military is troubling. He also expresses shock that this subject hasn’t been fully addressed in contemporary fiction. From here the conversation moves to international politics and Brexit and to our era of ‘fake news’. Self’s most recent novel is over 600 pages with no paragraph break – a form he says may be intimidating for some readers. He explains that his impulse to write stream of consciousness comes naturally because that’s how he lives his life and because he doesn’t think in the simple past! He avoids constructed metaphors because he says, again, he doesn’t think in them. The conversation wanders (appropriately) to the area of psychogeography – the ‘aimless’ exploration of place and our emotional/cultural relationship to it. Using paper maps as opposed to GPS means you’re immediately enriching your experience of the city/place as you use it to explore. Sinéad and Will conclude with a short discussion about the work of James Joyce. Will says he re-reads Ulysses quite often and it has a profound emotional effect on him every time. The conversation was full of good humour, wit and sharp, wide-ranging observations and we are delighted to bring it to you in this hour long special episode of The Book Show.